Discussion in 'News' started by NobleProductions, Feb 9, 2019. As seen with our prior resets, Prison has received a huge overhaul to most aspects. Most notably, we've placed a larger focus on PvP in that it will be true 1.8 combat and armour stacking will be making its full return in its original glory just like it was over a year ago. As mentioned above, the server has been moved back to 1.8 which not only allows for the proper combat the server used to have, but it also allows for us to bring back armour stacking exactly as it was before. With that in mind, there has been an overhaul to the kits and how we distribute armour. Rather than having unique sets of armour per rank that are only useful for a small amount of time, all kits will now receive the same armour set that can be stacked. The primary difference is in how many pieces of that armour each kit will get and how often you get them. Fortune has seen a massive reduction this reset across the board. This will create a fairer balance between paying and non-paying accounts while still giving an advantage to those paying accounts. This goes hand-in-hand with the overall reduction in the time it takes to rank up, which should also reduce the over-reliance on boosters. As seen on all of our recent resets, we've been revamping the stores of the servers we reset. 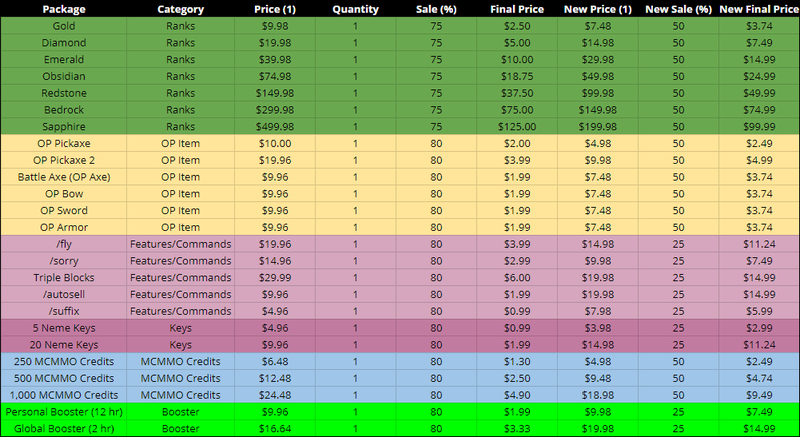 This includes changing up our pricing structure to be consistent across all of our servers, as before, the prices were wildly inconsistent depending on the store you visited. This revamp aims to combat that, while also giving us the chance to fix up any outdated packages we may have on there and adding in some new packages. At the end of the season, we will calculate those that have both reached the top rank and mine, and also those that have the most kills on the server. Calculation for final amounts will be done after the server is brought down at the end of the season. The winners will be posted on here once they have been calculated. Alongside this reset comes a plethora of minor changes that aim to improve your overall experience on the server. Hope to see you all on the server when it resets! Reset hype! Cannot wait to play.